Lawmakers will consider legislation this session, that would create a type of early warning system to to help identify schools facing significant financial problems. The state took over Gary and Muncie Community Schools last year after their finances reached crisis levels. Now, Sen. Eddie Melton (D-Gary) has filed legislation to prevent more major state takeovers by catching financial problems early. He says it’s a way the state could step in to help before it’s too late. Last year, the Legislative Services Agency came up with a “dashboard” style system featuring a list of key factors to analyze school corporations’ financial wellbeing. Melton’s bill would require a handful of state entities to research and report that type of data to determine if schools were at-risk for falling into financial distress. The state would then offer help to a corporation, by creating a unit to further investigate major problem areas and possible solutions for the state to offer “technical assistance.” Melton says that assistance could come in the form of additional professional development, an accounting specialist, or another solution that best fits the school corporation’s needs. But Melton says a key piece of the legislation is that the state won’t force districts to receive help. “And this is nothing that we’re mandating — I don’t believe we need to mandate this upon local school corporations to take this technical assistance,” Melton says. Melton says his bill is based on the list of factors shared by the Legislative Services Agency last year, but lawmakers will work during this session to come up with a final set of indicators for the state to report. 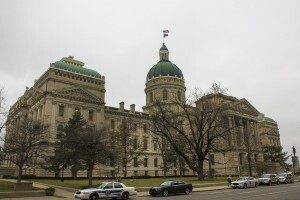 Rep. Tim Brown (R-Crawfordsville) is reported to be working on a similar bill in the House.